I’m not really a big French toast fan. I realize that’s probably not the best way to start a post that’s kind of all about French toast, but it’s true. I’m not crazy about it. I think it’s mostly a texture thing. Maybe I’ve just never had a good quality slice of French toast, or maybe I have and that’s just the way it’s supposed to be, but I’ve always found French toast to be either too soggy or too rubbery — not exactly the sort of textures I gravitate towards. See, I’m a bit of a texture freak, with drier, doughier, fluffier textures being my thing. This is why I’ll always choose rice over pasta, and why me and muffins have become BFFs. Texture. But I digress. Back to the French toast… or baked French toast, in this case. Not that the original was bad, per say, but it was definitely a little mushier than I prefer. I apologize for the slight picture overload (not really), but I need you guys to see what we’re dealing with here. Like, this is textural perfection. And that’s saying nothing about the taste. This bake straight up tastes like banana bread. Seriously. Banana bread or a banana nut butter sandwich. I know French toast is generally made with eggs, but I found the eggy taste to be a little overpowering when I tried it that way, so I swapped it out with half a banana and definitely like that version a lot more. 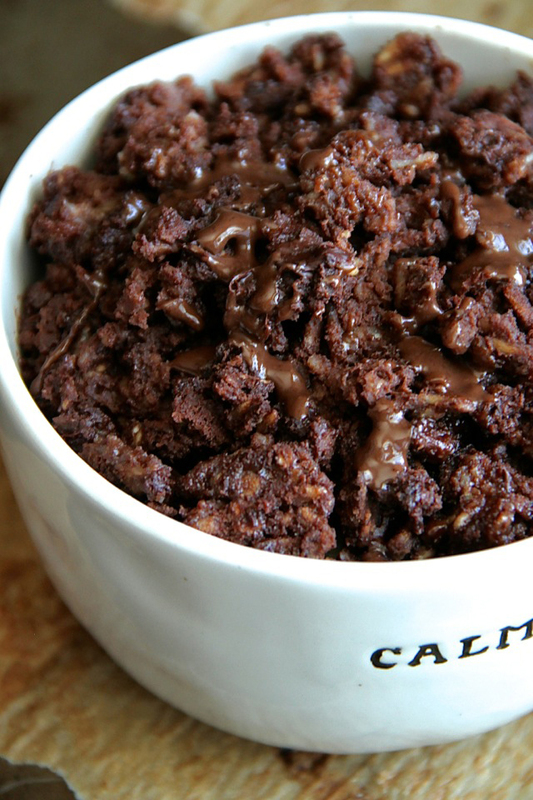 It also means that this bake is vegan and safe for people with egg allergies. Hooray! Preheat oven to 375F (190C) and lightly grease an individually-sized oven-safe dish. Set aside. Remove from oven and top with toppings of choice or simply enjoy as is! ** I used almond, but feel free to use whichever nut butter you prefer. Or, you can also leave it out completely. Click here for nutrition facts (includes optional nut butter). Are you a fan of French toast? « . thinking out loud #125 . Oh.my.gawd!!! 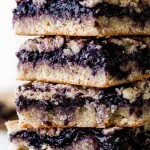 I am obsessed with all of your oat bakes but this one looks especially good! Holy cow! This looks so so yummy. I love how you take wholesome ingredients and make something simply wonderful out of it! Staaaahp! This looks so good. I’ve already eaten breakfast today, but I’d totally go for breakfast #2 if you put this in front of me. I know what you mean about the soggy thing, I’ve never liked french toast because my dad used to make it soggy with wonder bread that wasn’t even stale or dry, he loved it for himself somehow but I gag just thinking about it! This, on the other hand looks seriously incredible! And gluten free bread would actually work really well now that I think of it! I have a frozen loaf actually that I’ve been trying to figure out what to do with..
YUM. I’m with you on the French toast, I always preferred the doughy and chewy to soggy – but I might just have to eat my words after trying this combo! The single serve point is my fave! 🙂 This looks just too good and I love the spin you gave on french toast. I have never had it without egg so I am real curious now! Now THIS is a French Toast recipe I want to try (I’ve had the same experiences that you’ve had with French Toast in the past). Yum! My favorite is pancakes though. And I want to make this for lunch today — with my cinnamon raisin Ezekiel bread….When you finally come to NY, I will take you to the diner for THE BEST challah French toast of your life! I always loved challah French toast way more than waffles and pancakes. Holding you to that. And I actually tried this with the Ezekiel bread and it turned out really well! Haha I read the title and was like man, i don’t like french toast. Then I read your first sentence. So good job convincing this french toast hater to give this a try. I definitely like everything else in the ingredient list! Yes! Everything about this is amazing. This qualifies as breakfast because it has oats, right? I hope so ! Oh man, you definitely sucked me in with those fork shots. I almost tried to bite my screen! I’ve tried to make vegan french toast before and it sucked. Like you said, it was soggy and just, blech. 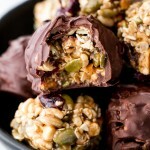 But I can see how adding oats would give it great texture. I’m definitely going to give this one a try! 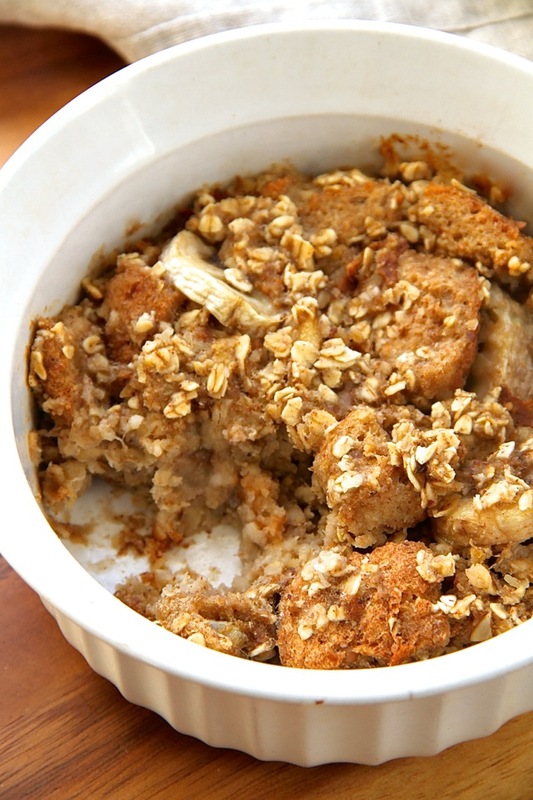 Oh good golly – you made french toast that tastes like banana bread?! 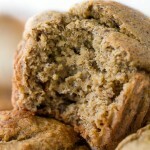 I am not a fan of french toast either – but I adore banana bread! 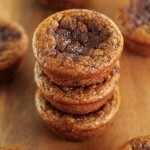 Thanks oodles for this brilliant recipe! Hope you have a wonderful weekend Amanda! I’m not a huge fan of French toast either. It seems like soggy bread to me. Waffles are my favorite but I don’t have a waffle iron so pancakes happen more often. This sounds like something I could eat. 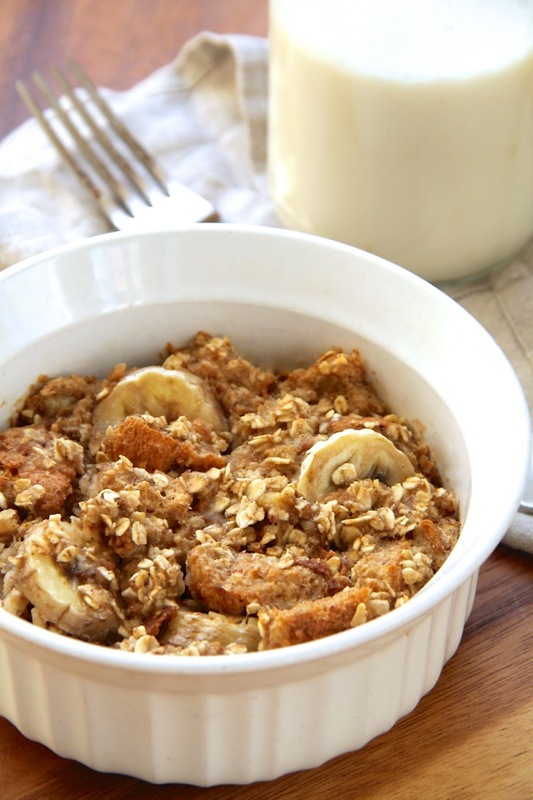 Glorified oatmeal with banana bread always has my heart! I’m a fan of pancakes as well, but mostly when other people make them… The flipping process stresses me out! This looks great! I would have to make two though – one for me and one for E! Oh my god this sounds aammmaazing! As always! I am not sure you have ever put a recipe on here that I have not loved! Yum! I agree about french toast too, I was never a fan because of the texture! But damn, this sounds good! I don’t like French toast either! But this does appeal to me. Thank you again for your lovely work Amanda, and I hope you have a fantastic weekend! 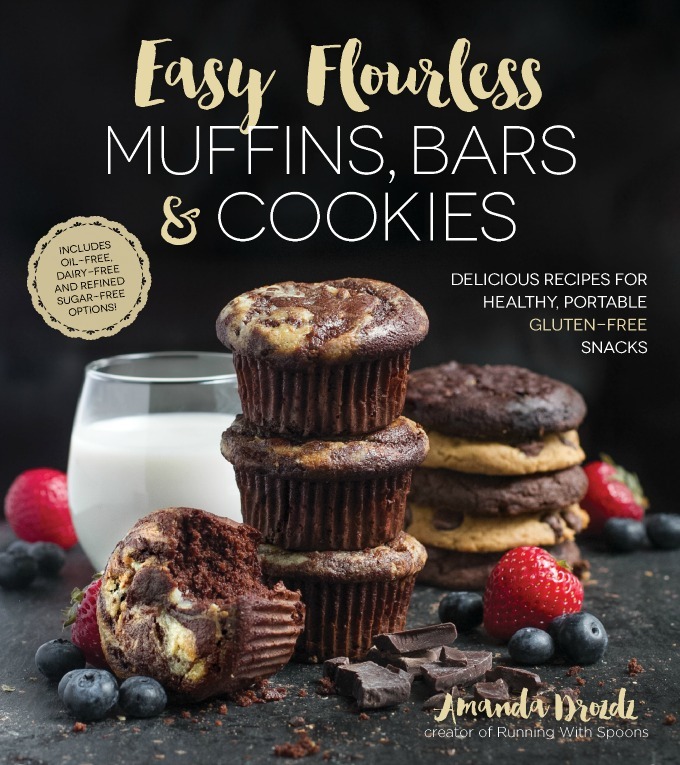 Your recipes are all amazing! Baked french toast and egg less = awesomeness! my mom is allergic to eggs so this would be great for her. With pictures this good, who needs a name anyway?! Also, you’ve never had French Toast done right. It should have a nice crispy, crackling exterior with a soft dough interior. 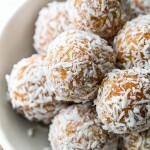 I also like to top mine with nuts, coconut flakes and fresh fruit to increase the textural perfection. This looks so good! Your pictures always make the food look delish! I can’t believe there are no eggs in this- Seriously, I’m almost embarrassed by my offering in the e-cookbook… oops. These look amazing. In fact all your recipes look amazing and your pictures are fantastic. I love the way you have the spoon in focus with the rest of the food out of focus. I’m supposed to be working but I just want to salivate over recipes all day now! PANCAKES! Definitely pancakes… with chocolate chips and bananas. I may or may not have eaten diner pancakes two nights in a row with my mom. 🙂 This looks really, REALLY good. I agree with the soggy texture of the French toast, but I think it has to do with the bread you use and whether it is stale or a thicker bread. I could be wrong, though. All I do know is I want this little bake in front of me! I actually really like waffles. I’m kind of a toppings girl, so I love to just smother my waffles in toppings. 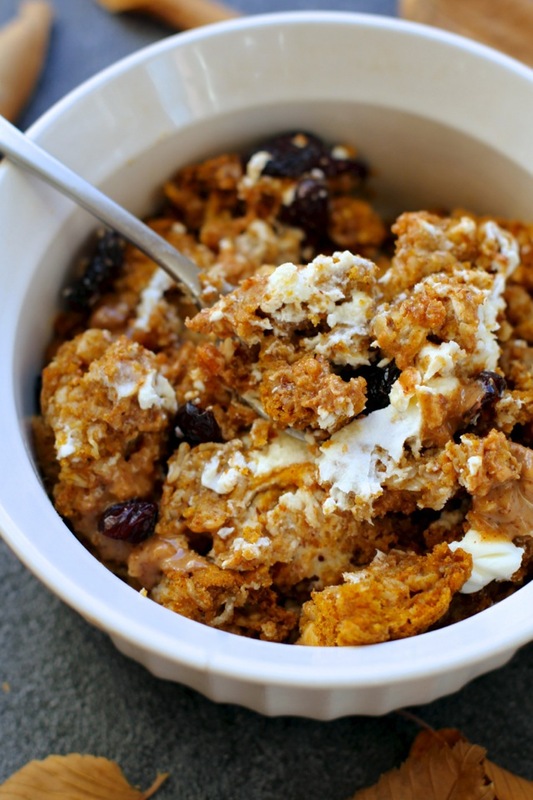 This recipe looks really good too, cause I’ve kind of been stuck in a yogurt, nut, and fruit rut for breakfast. This is going to make it into the rotation cause it’s SO simple looking. Thanks Amanda! 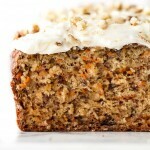 I adore banana bread – this looks amazing. I never use oats anymore which is weird because I used to eat them daily. 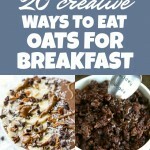 I think I need to try this since plain oatmeal doesn’t appeal to me anymore!! I don’t love the sogginess of French toast, either, but this… I think I can get behind this. It looks amazing 🙂 And I’m a pancakes person. You can make them so many different flavors and go cuh-razy with the toppings (and I love toppings)! I’m with you, I’ve never been a huge french toast fan. For me I really disliked the taste and texture of the EGGS on the bread. It was bizarre to me. I tried a vegan version with banana as the “soaking” agent and that was better, but I still prefer something like waffles or pancakes. THIS however, looks divine! I actually have no idea, Gerry. I rarely ever use my microwave so I have no idea how to cook in it! I literally have been thinking about this since I saw on your Insta!! I actually think I’m a waffle person… I think that makes me the minority!!! Wow this look like my perfect breakfast. 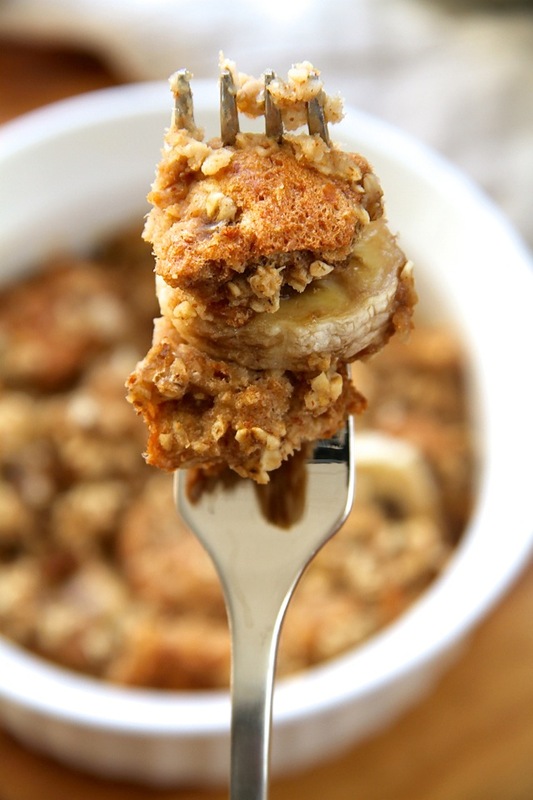 A healthy dose of banana bread with oats? I’m in! Pinned. I used organic cinnamon raisin bread. It put a different spin on this and was delicious. Thank you for the recipe! Wow! I just had this for breakfast, and it was delicious! I’ll definitely be checking out your other recipes. Wow! I just had this for breakfast, and it was delicious! 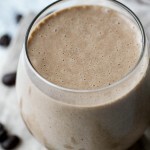 A great, cozy, healthy way to start the day. I’ll definitely be checking out your other recipes! So yummy! I used honey instead of maple syrup and ended up baking it for 25 minutes instead of 20. Topped it with syrup which made it more delicious! I discovered this yesterday on Pinterest and tried it today. It is AWESOME! Thank you! On which mode in the oven do i bake it? Right now im trying both upper and lower heats nd after 30 mins its not ready yet.. Am i supposed to set it on higher temperature? Looks super yummy!! 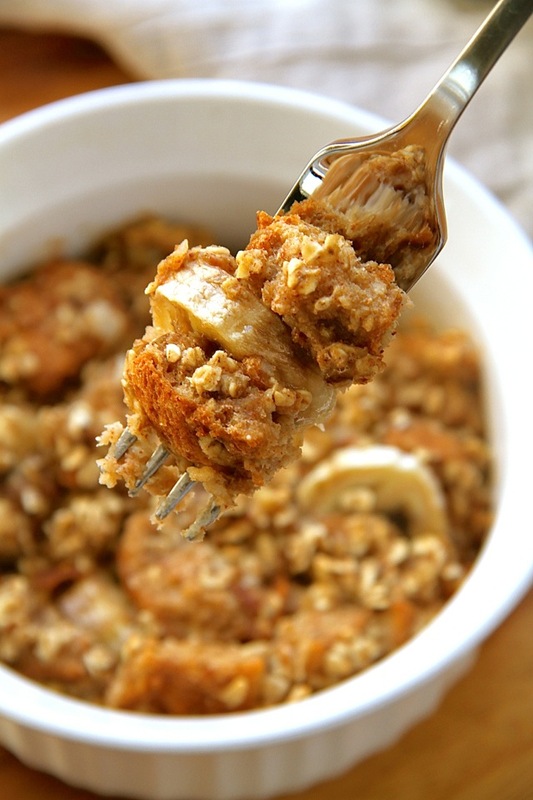 Can I use regular rolled oats or do the have to be quick cooking ones? Regular should be fine, Rowan! I made this today and used cinnamon raisin bread and omitted the syrup. It was delicious! I only wish there was more! Any idea on proportions to make this in a 9×9 dish? Maybe triple the ingredients? Do you think this would be good made ahead of time and then re-heated? The texture might be slightly different, but I can’t see why not! 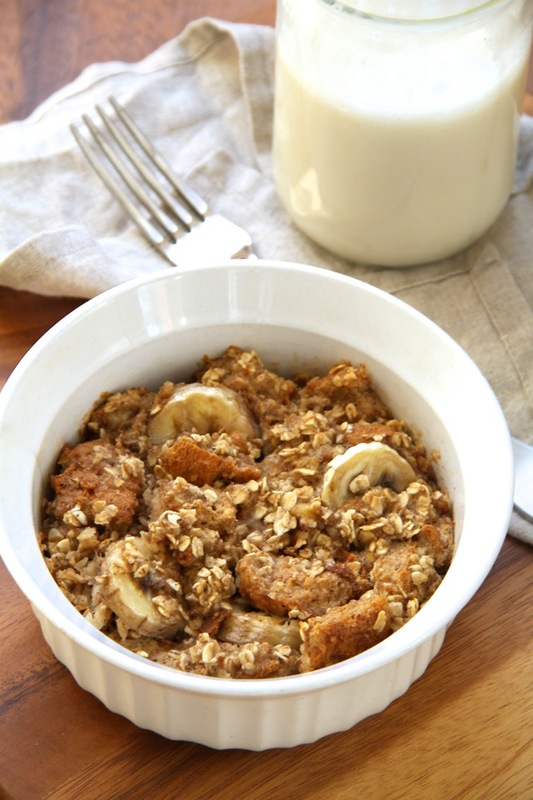 It would probably be similar to reheating baked oatmeal, which I’ve done before with no problems. I am trying this with normal milk… Do you think it will work? I will get back to you to see if it does. That should work just fine, Lauren! Just made this and ate it with a little sugar free maple syrup. Loved it and thanks for sharing!!! i made this morning and i tried to triple the ingredients. i used peanut butter for the nut butter. i used a stale millet bread and it turned out little bit soggy. next time i will use a different bread and maybe add another fruit. and also bake longer. Just made this… put extra maple syrup because i love the taste so much and used nutmeg instead. it was smashing. you could put in nuts and or anything else and it will only make it taste better. I’ve been making this recipe nonstop for the past 2 weeks – definitely at least 6 times by now. 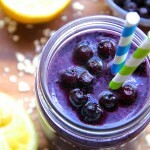 It is so easy and so delicious! I was making it without nut butter at first, but then I started adding almond butter and I’m never going back – it adds a really nice nuttiness. I especially love how there’s very little cleanup. It’s basically just the mixing bowl and the cooking ramekin and then you’re all set! I enjoy making crepes for breakfast, but they take so much longer and leave way more dishes, so this bake has been my morning staple. I’m so glad you like it, Sarah! Thanks so much for taking the time to let me know. And I adore crepes too, but you’re right – the process of making them is a little much to do daily. Just wondering if there was any version of this that I can do in the microwave because we’re in between houses fight now so I can’t bake yet. Sorry, Maali, but I haven’t tried it so I’m not sure how it’d work out. This looks amazing! I might have to make it for Christmas morning. What is your favorite kind of bread to use for the recipe? One of my family’s favorite recipe at home! Definitely satisfies my sweet tooth and my husband who is huge on eating healthy loves it so much!! Wow, this was really good! I prefer my breakfast a little sweeter so next time I may add a touch more syrup, or I’ll just follow the suggestion to cut up the rest of the banana on top of it. Soooo simple, quick, and yummy! Thank you for the recipe! I made this for breakfast this morning and it was so good. I’m not a big fan of french toast because as you said it’s usually soggy or rubbery. This is delicious. It crisped up nicely on top. As a new vegan (just 3 weeks in) I find breakfast to be the most difficult meal to make. I will definitely be making this again. Next up is the blueberry muffin bake. This looks amazing. Can’t wait to try it. I can’t eat rolled oats but I can eat steel cut oats. Do you think this would work ok with quick cook steel cut oats? Thanks so much! Banana is my favorite fruit. I try to eat all recipes with it. I always eat porridge with banana and cup of tea. Thanks a lot for your recipe Amanda! How long would I bake this for if I’m cooking for 6 people? 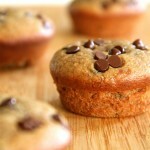 I just happened upon this recipe this morning when looking for something different for my kids. I doubled it and made it in my jumbo muffin tin. I kept the same bake time and it turned out wonderful! I also didn’t have any syrup or honey (ran out of both baking this week) so I used about 1 and 1/2 tsps of Truvia brown sugar blend. I’ve never seen this kind of breakfast recipe before. I would like to make this for a group of people. 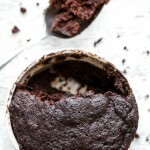 Can I multiply the recipe and use a larger pan? If so, what is the recommended bake temp and time for a larger batch? Could this be made the night before and popped in the oven in the morning, looking to meal prep. Yes that should be totally fine, Sabrina! Wow! 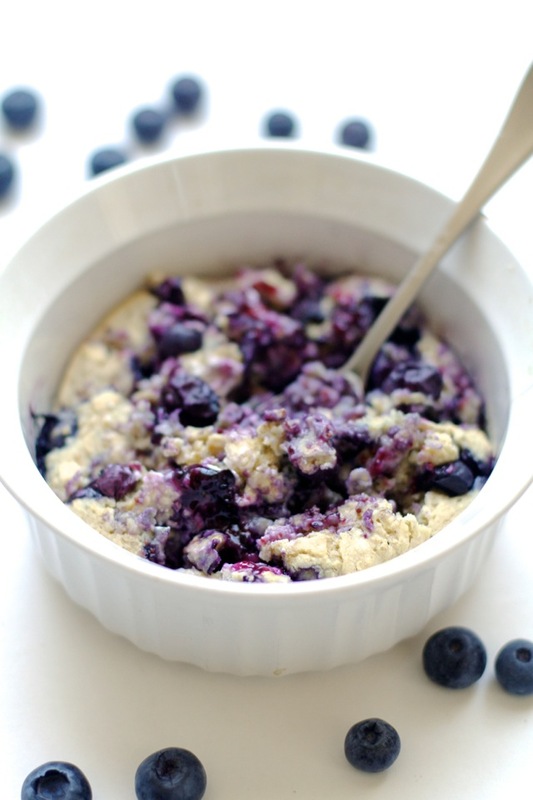 I made this recipe this morning after seeing it on Pinterest a few days ago and I have two words: “OMG Amazingggg! !” I am trying to stay away from eggs for breakfast after eating eggs constantly. So I searched “vegetarian/vegan breakfast options” and this recipe came up. It is soooooo good 🙂 Thank you for sharing! Amanda, Thanks for the recipe. Delicious! 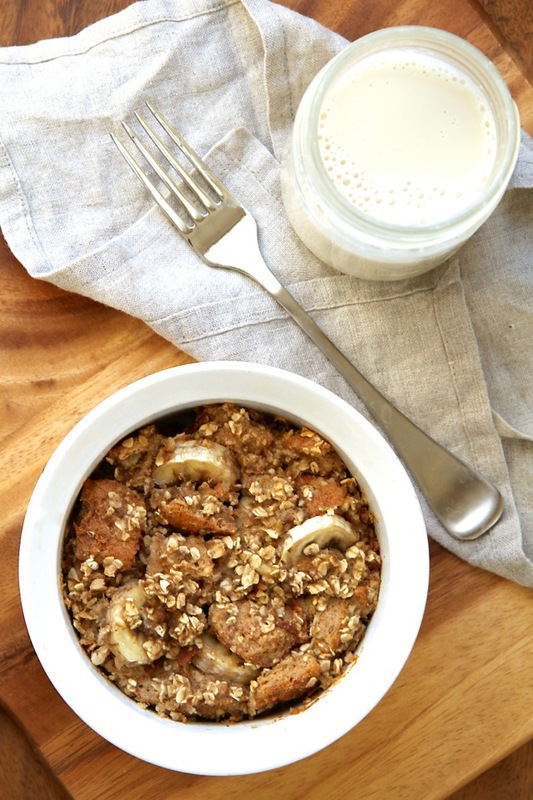 I really loved this French Toast with oats without eggs! I tried it for my kids adding an extra spoon of maple syrup and 1/2 tsp of honey over the bread cubes. Delicious! Amanda, Delicious! I wonder, but a lot of calories? French toast is half-baked and it seems something good. Roasted oatmeal toast is quite unique dish. For those who like bananas, vitamin rich foods. 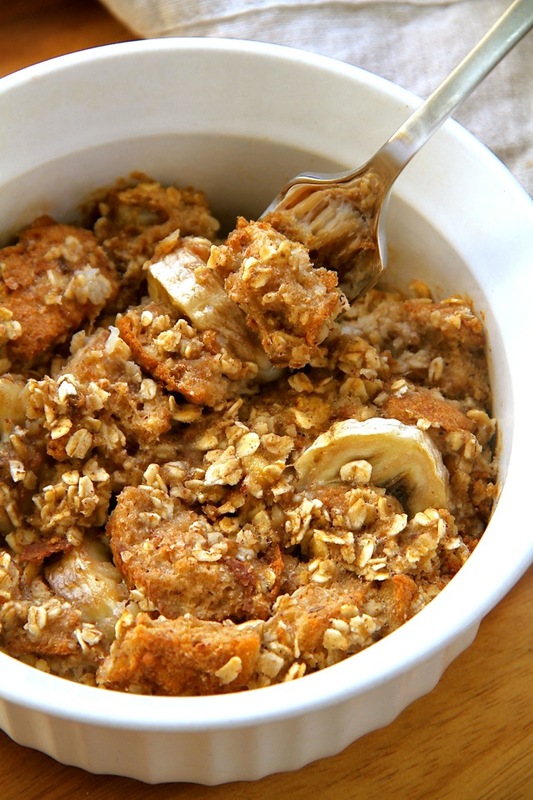 Legit speechless, that banana oat baked french toast recipe looks unreal! Definitely, I will make it on the weekend for my family. 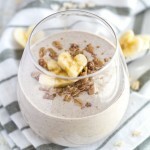 This is one darn delicious and healthy breakfast indeed. Sure to provide some good amount of energy for starting one’s day. Like the fact that it has a good amount of fiber content.